Which magnetic phenomena can actually be realized in single molecules (i.e., quasi-zerodimensional spin structures)? This includes e.g. static and dynamic ordering phenomena such as phase transitions or spin glass characteristics. What is the response of these spin structures to changes such as structural distortions, redistribution of spin centers, or changes to the exchange connectivity between the spin centers? What happens when spin clusters are interlinked to result in multidimensional networks? How can magnetic molecules be utilized in the area of molecular spintronics, i.e., the combined exploitation of molecular charge and magnetic states? How can we contact molecules or attach them to conducting as well as non-conducting surfaces for this very purpose? What effects do non-standard ligand fields have on the spin centers? How does the electrostatic environment affect the molecular magnetic characteristics? What theoretical approaches can be used to adequately model these relations? Closely linked to this topic are our projects focusing on the chemistry and physics of polyoxometalates, a class of compounds with an unmatched potential for chemical functionalization and structural complexity. Polyoxometalates allow for a structural and electronic control that far surpasses that known for classical coordination compounds. These molecular metal oxide clusters can even aggregate to ultra-large oligomeres that fill the gap between discrete molecules and molecule-based network structures. This allows us to study the transition from discrete to extended, multi-dimensional structures in terms of electronic and magnetic properties. The chemistry of polyoxometalates still poses several fundamental questions, since the precise reaction mechanisms underlying the self-assembly of these nano-scaled clusters remain unknown. Likewise, their syntheses remain serendipitous and rational synthesis strategies are still rare. We are also interested in the homogeneous catalytic activity of such polyoxometalates. Here, oxidation catalysis, water oxidation, and O2 activation as well as the integration of hydrolytically stable systems in photochemical cells are being explored. Lanthanide complexes can have very interesting magnetic properties, in particular a high anisotropy making those potential targets as quantum bits. We are developing new families of aromatic ligands based on phthalocyanine or cyclopentadienyl groups tailored to strongly affect the magnetic properties of the complexed ions. Additionally, the ligands are designed to allow for deposition on a surface, thus allowing for subsequent investigation of the properties at the scale of the isolated molecule using scanning tunneling microscopy (STM). The latter studies are conducted in the group of Prof. C.M. Schneider (Peter Grünberg Institute (PGI-6), Jülich Research Center). S. Fahrendorf, N. Atodiresei, C. Besson, V. Caciuc, F. Matthes, S. Blügel, P. Kögerler, D.E. Bürgler, C.M. Schneider, Nature Commun., 2013, 4, 2425/1-6. 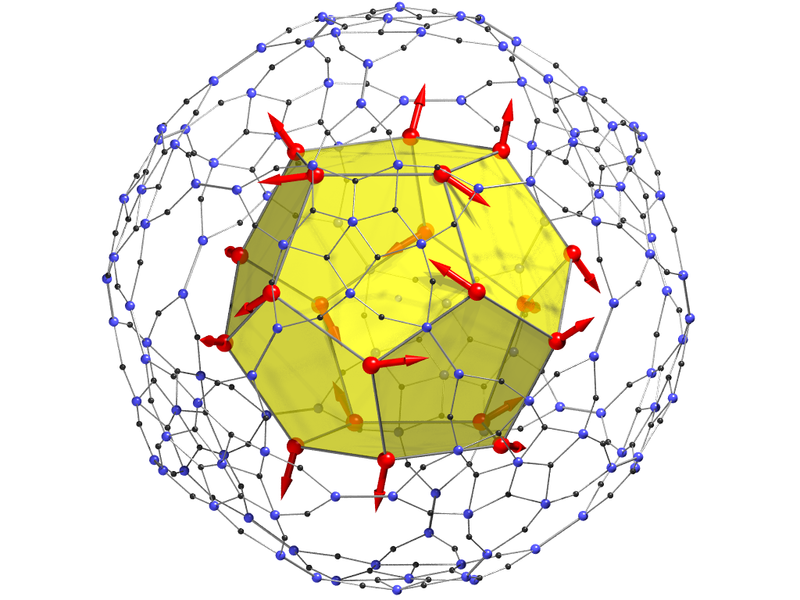 Polyoxometalates (POMs) are discrete high-nuclearity oxoanions of early transition metals, most commonly V, Nb, Ta, Mo, and W in their highest and second-highest oxidation states. The ability of variety of polyoxomolybdates and -tungstates to act as polydentate O-donor ligands towards different electrophiles and stabilize large polynuclear assemblies of magnetic metal ions within fully inorganic metal oxide framework allows preparation of numerous species with intriguing structures and properties. The ability to undergo redox transformations without significant structural changes, thermal stability, tunability of magnetic properties and large dimensions (1 – 5 nm) render such complexes very attractive for applications in molecular magnetism, catalysis, molecular nanoelectronics and medicine. Our efforts are focused on development of synthetic approaches allowing attachment of electrodes precursors to discrete magnetic polyoxoanions at specific positions on the path to single-molecule spintronic devices. • Development of CONDON 3.0 and wxJFinder. 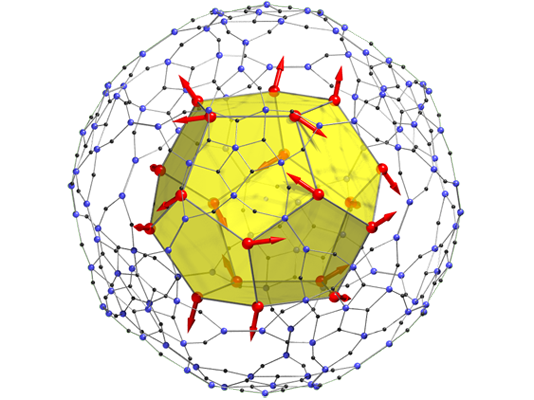 • Modeling and simulation of the magnetic properties of isolated or multiple, interacting d- and f-metals. • Support of the above-mentioned projects by magnetochemical analysis of metal complexes. We design and synthesize complexes that combine interesting magnetic properties with chemical functions allowing a covalent attachment to carbon nanotubes and various spectroscopic handles that can be used to characterize the obtained material from the macroscopic to the nanoscopic scale. In collaboration with the group of Dr. C. Meyer (Peter Grünberg Institute, Jülich Research Center), we react those molecules with nanotubes grown on various substrates. The influence of the functionalization on the charge and spin transport properties of the nanotubes can then be investigated by Dr. Meyer and her coworkers. C. Meyer, C. Besson, R. Frielinghaus, A.-K. Saelhoff, H. Flötotto, L. Houben, P. Kögerler, C.M. Schneider, Phys. Status Solidi B, 2012, 249, 2412-2415.